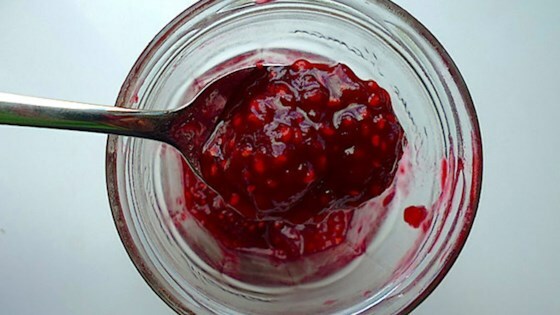 "I was experimenting with making jam without pectin and it turned out really yummy. You need to cook the raspberries for a pretty long time until they fall apart." Combine raspberries, sugar, and lemon juice in a saucepan and mix well. Cover and refrigerate overnight. Inspect 3 jars for cracks and rings for rust, discarding any defective ones. Immerse in simmering water until jam is ready. Wash new, unused lids and rings in warm soapy water. Slowly bring raspberry mixture to a boil and simmer uncovered over medium heat until the mixture is no longer liquid, 40 minutes to 1 hour. Stir every few minutes and skim off any foam with a ladle or a large spoon. Ladle raspberry jam immediately into the prepared jars, filling to within 1/4 inch of the top. Run a clean knife or thin spatula around the insides of the jars to remove any air bubbles. Wipe rims with a moist paper towel to remove any spills. Top with lids and tightly screw on rings. Place a rack in the bottom of a large stockpot and fill halfway with water. Bring to a boil and lower jars 2 inches apart into the boiling water using a holder. Pour in more boiling water to cover jars by at least 1 inch. Bring to a rolling boil, cover, and process for 10 minutes. Remove the jars from the stockpot and place onto a cloth-covered or wood surface, several inches apart. Let rest for 24 hours without moving the jars. Gently press the center of each lid with a finger to ensure the lid does not move up or down. Remove the rings for storage and store in a cool, dark area. Very easy to prepare and I also to had all the ingredients. thank you very much for sharing this recipe I already want to make it again. Love raspberry anything! I wonder if you could freeze it? ?